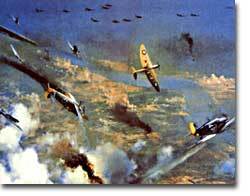 Although short of planes and pilots, the British Royal Air Force managed to hold off Hitler's Luftwaffe during the Battle of Britain. Two days after Britain and France declared war on Nazi Germany, President Roosevelt issued a proclamation of neutrality and ordered the suspension of munitions sales to all belligerents. But Roosevelt stopped short of asking that Americans remain emotionally neutral in the European conflict. FDR knew that the only chance Britain and France would have to defeat the German Reich was to have ample supplies of weaponry. He immediately began to press Congress to repeal the arms embargo. The request was simple. Allow trade of munitions with belligerent nations on a "cash and carry" basis. There would be no danger to American shipping if the Allies had to carry the supplies on their own ships. Isolationists were concerned, but support for the President's initiative was strong enough. The Neutrality Act of 1939 ended the arms embargo and permitted the sales of munitions on a "cash and carry" basis. Meanwhile, the European war seemed to be more talk than action. Throughout the fall and winter of 1939-40, Stalin moved Soviet troops into sovereign Eastern European states including eastern Poland, but Hitler's Wehrmacht was silent. Europeans nervously joked of a "phony war" as the winter drew to a close. Suddenly on April 9, 1940, the German blitzkrieg moved rapidly into Denmark and Norway. As the weeks passed, the German war machine steadily advanced through the Netherlands, Belgium, Luxembourg and into northern France. Hitler arrived in France to sign the terms of French surrender. The hapless French were forced to submit to the Germans in the very same railroad car the Germans surrendered twenty-two years previously at the end of World War I. Britain was the only democracy in Europe in open opposition to Germany. Not to be outdone by the swelling "Arsenal of Democracy," German production increased as well during World War II. New Prime Minister Winston Churchill desperately pleaded with Roosevelt for assistance. In the summer of 1940, Hitler launched Operation Sea Lion, an all-out assault on the British mainland. The Royal Air Force of Britain battled the German Luftwaffe in the greatest air battle in history as Americans watched nervously. Slowly but surely American public opinion shifted toward helping the British. The Committee to Defend America by Aiding the Allies launched a propaganda campaign to mobilize the American public. Groups like the America First Committee, which contained prominent Americans such as Charles Lindbergh, insisted a hemispheric defense was the wisest choice for the United States to follow. A great debate was on. Miraculously Britain held its own with Germany while America deliberated. In September 1940, the United States agreed to the transfer of 50 old destroyers to the British fleet in exchange for naval bases in the Western Hemisphere. By directly aiding the Allies, America could no longer hide behind the shield of neutrality. At Roosevelt's urging, Congress authorized the construction of new planes to defend America's coast. 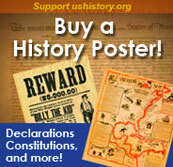 Congress also enacted the first peacetime draft in the nation's history in September 1940. The interventionist argument seemed to be prevailing, but debate continued into 1941. Congress eventually approved the Lend-Lease Act, but not without a great deal of debate. Senator Robert Taft argued that the Act allowed the U.S. "to carry on a kind of undeclared war." The Destroyer Deal was helpful, but Britain simply did not have the financial reserves to pay for all the weapons they needed. 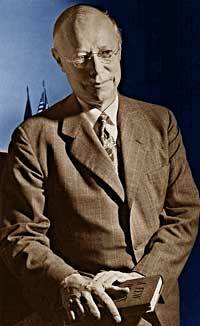 Roosevelt feared another postwar debt crisis so he hatched a new plan called Lend-Lease. Roosevelt publicly mused that if a neighbor's house is on fire, nobody sells him a hose to put it out. Common sense dictated that the hose is lent to the neighbor and returned when the fire is extinguished. The United States could simply lend Great Britain the materials it would need to fight the war. When the war was over, they would be returned. The Congress hotly argued over the proposal. Senator Robert Taft retorted: "Lending war equipment is a good deal like lending chewing gum. You don't want it back." In March 1941 after a great deal of controversy, Congress approved the Lend-Lease Act, which eventually appropriated $50 billion of aid to the Allies. Meanwhile Roosevelt began an unprecedented third term. Neutrality was no longer a façade behind which America could hide. 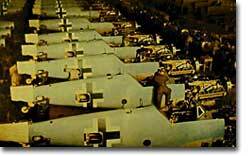 Hitler saw Lend-Lease as tantamount to a war declaration and ordered attacks on American ships. The first is freedom of speech and expression — everywhere in the world. The second is freedom of every person to worship God in his own way — everywhere in the world. The third is freedom from want, which, translated into world terms, means economic understandings which will secure to every nation a healthy peacetime life for its inhabitants — everywhere in the world. The fourth is freedom from fear, which, translated into world terms, means a world-wide reduction of armaments to such a point and in such a thorough fashion that no nation will be in a position to commit an act of physical aggression against any neighbor — anywhere in the world. Congress still vacillated. Roosevelt met with Churchill in the summer of 1941 and agreed to the Atlantic Charter, a statement that outlined Anglo-American war aims. At this point, the United States was willing to commit almost everything to the Allied war machine — money, resources, and diplomacy. The only thing missing was American troops. In January 1941 things weren't looking good for Europe. The Western half of the continent lay under Nazi control and Hitler looked unstoppable. It was then that FDR delivered his "Four Freedoms" speech, calling for the spread of the American ideals of liberty and personal freedom. Listen to an excerpt of the speech and view some Norman Rockwell paintings inspired by the address at the National Archives website. The Battle of Britain Historical Society presents a site you don't want to miss. While focusing on the Battle of Britain with details that include in-depth profiles of Royal Air Force and Luftwaffe aircraft, and a chronology of the Battle of Britain, there is also a comprehensive review of the events leading up to 1940, starting with the rise of the Third Reich. The links section is highly recommended. Famed aviator Charles Lindbergh was among the many public figures urging FDR to stay out of war. Read Lindbergh's Des Moines address for his views on the media, President Roosevelt, and the European conflict. This online companion to a PBS film about Lindbergh offers a timeline and many maps. Lindbergh's controversial address, delivered in Des Moines, Iowa, on September 11, 1941. The Avalon Project at Yale Law offers this broad collection of World War II documents including international agreements, proclamations, and speeches. Follow the link to "The Atlantic Charter" for text of the joint agreement between President Franklin Roosevelt and Prime Minister Winston Churchill that firmly defined the Allied principles: "All of the nations of the world, for realistic as well as spiritual reasons, must come to the abandonment of the use of force." With a superior collection of Winston Churchill's speeches, quotes, links, and a biography, this site is a vital Churchill resource. Click on "Never Give In, Never, Never, Never": "Never give in — never, never, never, never, in nothing great or small, large or petty, never give in except to convictions of honour and good sense."